There are a ton of activities to choose from at Shangri-la’s Villingili Resort in the Maldives. Just from water sports alone, there numerous excursions, diving trips and lessons, deep sea fishing, and many more. On land, there are also a huge range of activities from Yoga and other exercise classes, to Eco tours, and even tours to take you to the local island (Gan). 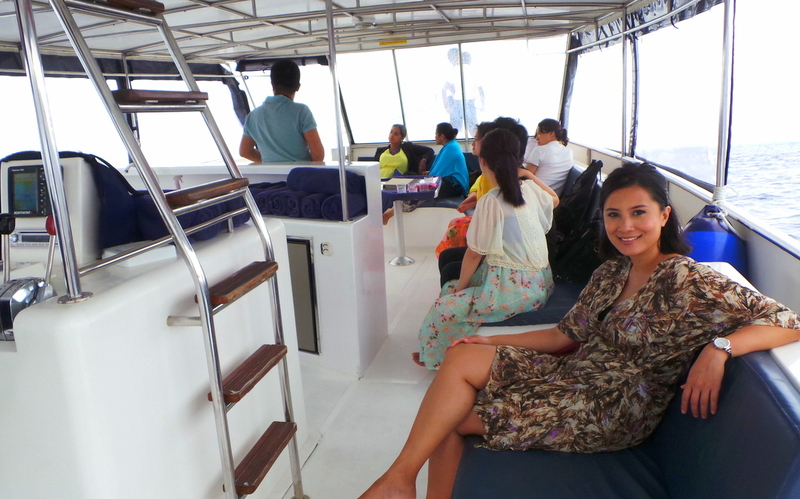 As water enthusiasts, we took up 2 activities while we stayed at the resort: Scuba Diving and Dolphin Cruise. Shangri-la has a very organised PADI Dive Centre. We joined them for a Manta Ray dive one morning. All equipment were new and clean. The boat was massive so thankfully I didn’t get seasick. 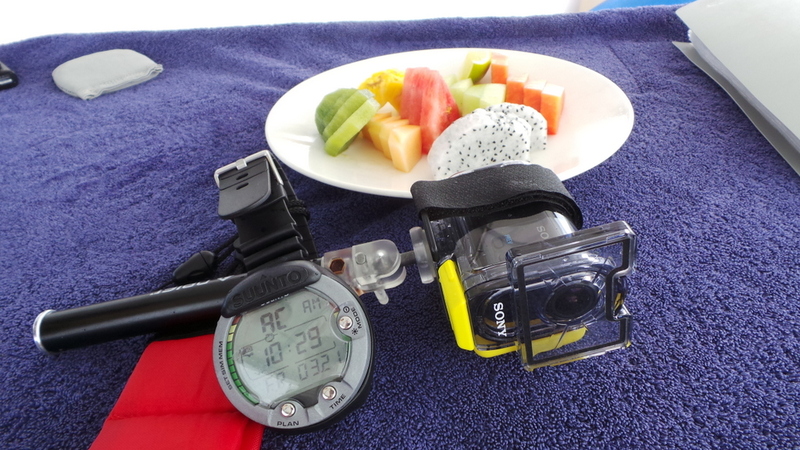 To our delight, we were given Sunto dive watches (just to wear for the dive). 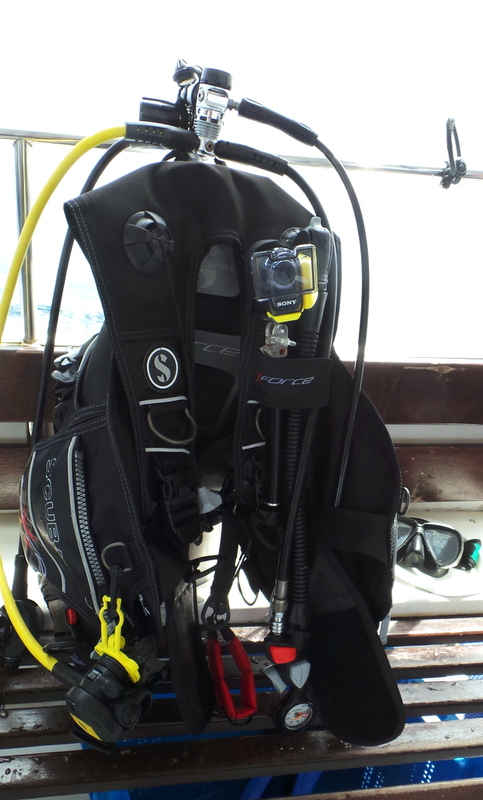 This was a first for us – a dive where you are given individual dive watches, and in brand-new spankin’ clean conditions too! 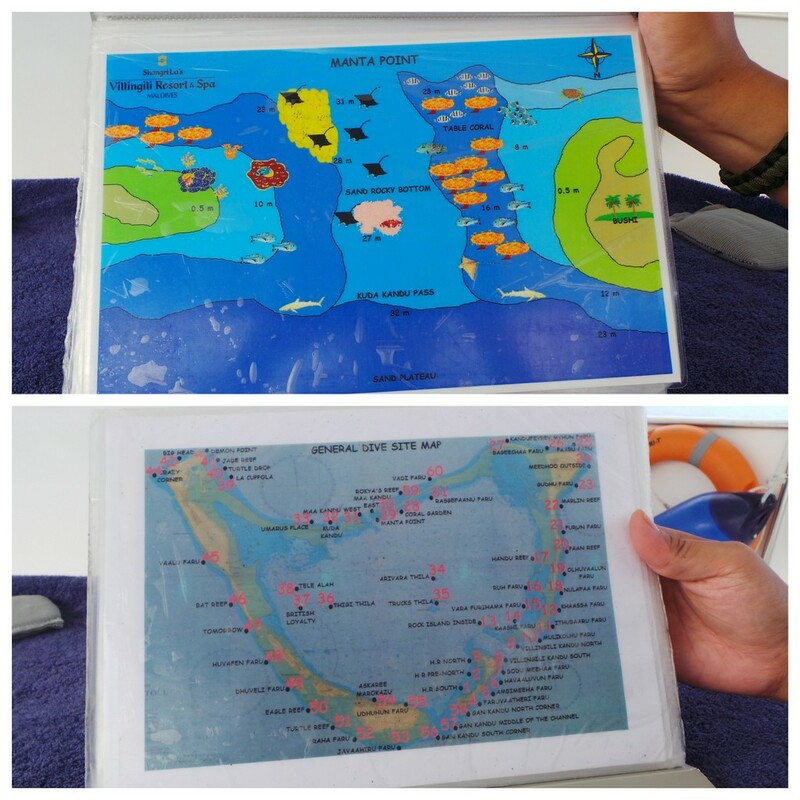 We were shown our route and where we will be stopping for the dive. Our first stop was Manta Point. We stopped at the point, and one of the dive masters jumped in. Not only was the current quite strong, but there were no mantas 🙁 Ah, well this happens so we move on. 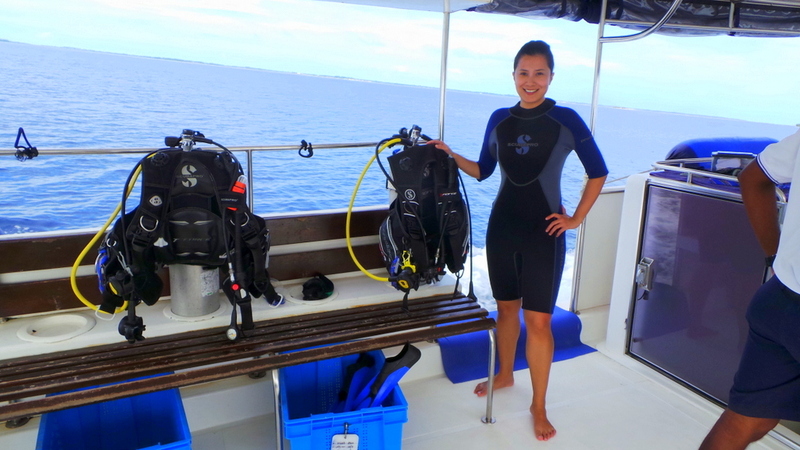 So we moved spots and kind of did a drfit-dive seeing various underwater creatures.We may have missed the mantas but we did see a tiger shark!! It was so unexpected that Zombie was only able to get just a portion of its tail as it swam past. It was abit surreal, to see a shark that huge, and only later realise it was a tiger shark. It was so peaceful, calm and kind of uninterested. It swam past us towards the opposite direction. We realise it was a rare sighting for a tiger shark, more so in these waters. We also joined a Dolphin Sunset Cruise one afternoon. This was a first time for us, and I can only describe watching the dolphins swim directly with the boat, or underneath the boat, and watch them flip and spin as magical. 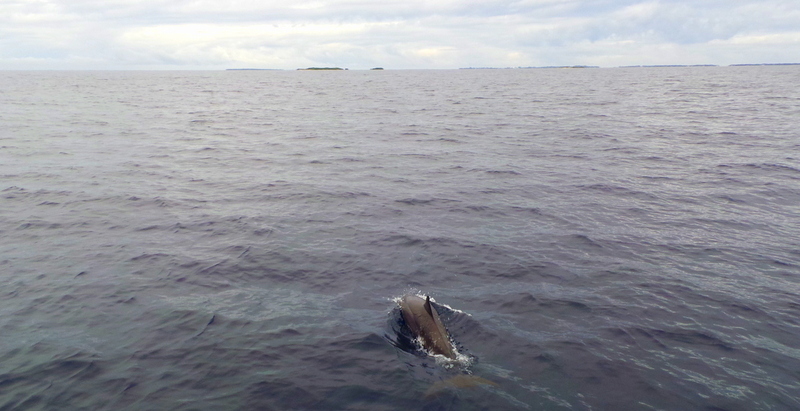 There were different pods of dolphins, and they seemed to enjoy swimming next to our boat. They were spinner dolphins, the most social among dolphin species. They are called such because they flip and spin in the air. They are active during night time, so the dolphin cruises happen during sunset. I love how organised they have done this activity. 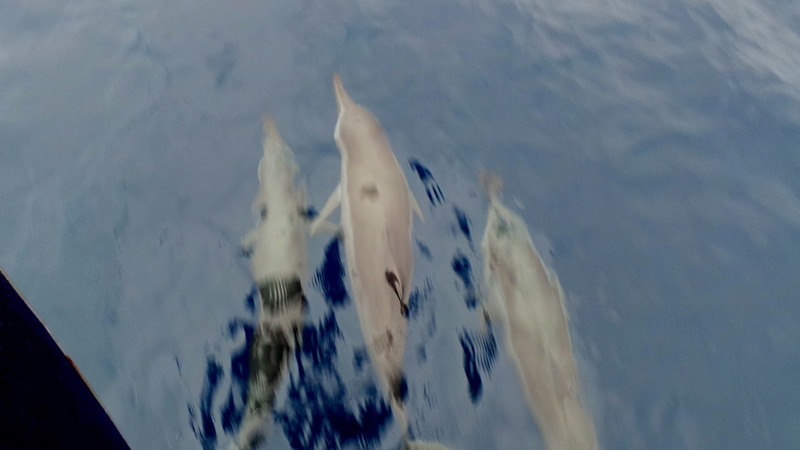 There weren’t that many guests onboard too so we all had a pretty good view of the dolphins. I normally get very seasick quite easily but I really had fun doing this cruise. It’s an activity that I’m sure everyone will enjoy, even those who don’t like getting in the water. I'd love to see dolphins in the wild where they should be! Looks like a great experience all round! Hi Becky! Thanks for the visit 🙂 Yes yes, Im so happy to see dolphins and all other sea creatures in the wild. Places like seaworld/ocean parks stress me out. 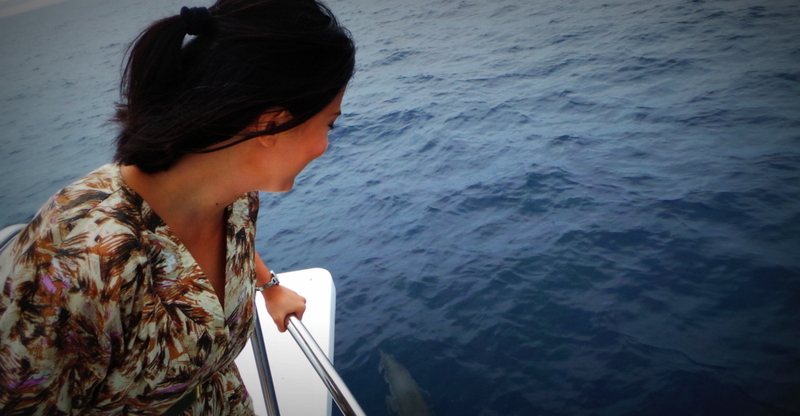 It does feel very grand to be “welcomed” by dolphins/animals into their world.